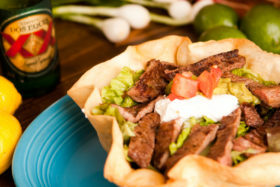 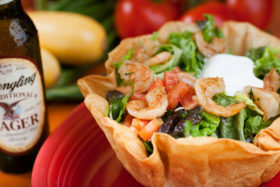 A taco salad shell filled with refried beans, lettuce & diced tomatoes garnished with guacamole, sour cream and Mexican shredded cheese. 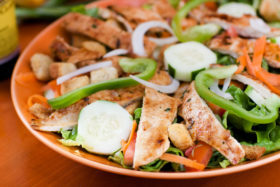 Citrus-pepper marinated chicken breast or steak served over lettuce with cucumbers, onions, tomatoes, carrots and your choice of dressing. 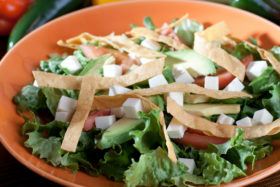 Mixed Greens, diced tomatoes, onions, Mexican queso fresco, avocado chunks finished with creamy chipotle ranch dressing, and crunchy tortilla strips.